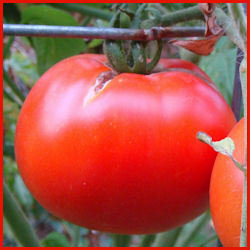 Last year's tomato blight, possibly carried by commercial plants, has many gardeners thinking about starting from seed. Whether you've an experienced seed starter or are trying it for the first time, you'll find some good tips and step by step techniques here. The fun starts with deciding what kinds of tomatoes you want to grow. With over thirty-five hundred entries in PlantFiles, you have an amazing variety of colors, shapes, and sizes to choose from. You'll find short plants for containers, early producers for short growing seasons, disease-resistant hybrids, flavorful heirlooms–the choices go on and on. By growing from seed, you're not limited to the plants your local nursery chooses to sell. I've grown tomatoes for years, but I've had the best results using what I've learned here at DG, especially Dr. Carolyn Male's method of starting tomatoes from seed. If you hang around in the Tomatoes forum, you'll see a lot of "why?" questions answered with "because Carolyn says so." Thanks, Carolyn! Carolyn recommends starting no sooner than 6 to 8 weeks ahead, giving you 9 to 12 inch seedlings that have been transplanted once. I used to start sooner, as many people do, ending up with huge plants for my garden. But it turns out that smaller, younger plants grow and produce much better after I plant them out. Here, I plant out tomatoes in mid-May, 2 or 3 weeks after our average date of last frost. Can I sow seeds right into my plant pots? It's better to use a seed starting tray. 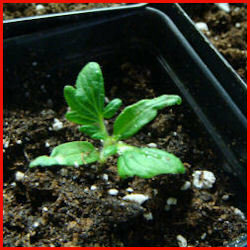 The seedlings will be more vigorous, with better roots, if you transplant them once, soon after they germinate. Sow seeds in a shallow container filled with an inch or two of barely-moistened soil-less potting mix, about half an inch apart. Cover the container with a dome or a plastic bag. Leave a little gap in the cover, or add a few small holes for ventilation. You can buy special seed starting trays with domes, or you can punch holes in covered take-out containers as described in this article on sowing seeds. What about heat and light? Warmth speeds germination. Put your seed starting tray in a warm spot or on a heat mat, and then watch it closely. At the first sign of germination, move it to a light shelf. Tomato seedlings like it cool (between 50 and 70'F is fine) once they sprout and will get very leggy very quickly if left in a warm spot. Your sunny windowsill isn't as sunny as you think. It can work, but you will get stronger seedlings by setting up a fluorescent light to give them 14 to 16 hours of light each day. An inexpensive shoplight with two 48" cool fluorescent tubes provides enough light for an two entire flats (36 plants per flat) of tomato seedlings! Keep the lights just an inch or two above the seedlings. 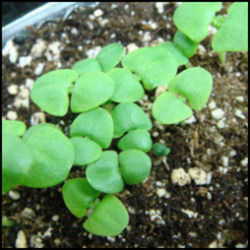 The first pair of leaves emerging from the seed coat are cotyledons, or nurse leaves. They don't look (or smell) like the "true" leaves that will follow. Usually the seed coat falls off on its own, but occasionally one will get stuck. 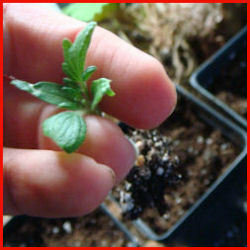 You can free the seedling from the seed coat with spit-moistened fingertips or a damp cottonball. Hold the seed coat gently for a few moments, then slip it off. When the seedlings have one or two pairs of "true" leaves, it's time. You don't need huge pots. Deep 2 inch pots or 6 oz plastic cups (with drainage holes poked in the bottom) provide plenty of room for 6 weeks of root growth. Fill your pots with moistened potting mix. A pinch of polymer moisture crystals can be helpful, but don't add fertilizer to the mix or to the water until the plants are in your garden. Poke a hole in the center of the potting mix. Gently break out a row of seedlings from your seed starting tray, and separate them into individual plants (or pairs of seedlings, if you'd like). 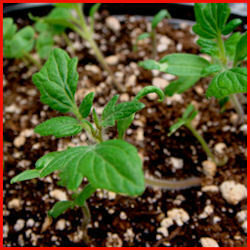 Handle the seedlings by the leaves as much as possible; don't hold them by their fragile stems. Poke the seedling down into the hole, deeper than it was growing in the tray, all the way up to that first set of "nurse" leaves if possible. The buried part of the stem will grow extra roots. If your seedlings got a little leggy, deep planting will make them sturdier. Water in each seedling with a gentle stream to settle the potting mix around the roots. From this point on, bottom watering will help prevent damping off and reduce fungus gnat and algae problems. As an additional precaution, I like to add hydrogen peroxide when I water (1 tablespoon of 3% HP per quart of water). 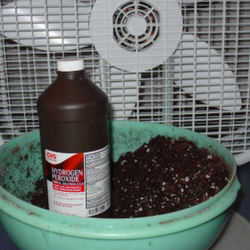 You don't want the little plants to wilt, but try to let the potting mix dry out a bit between watering. Resist the temptation to fertilize! Even with a weak solution is more than they need, and they will be stronger without it. Keep adjusting your lights so they're just above the top leaves. Movement will make the stems even sturdier. 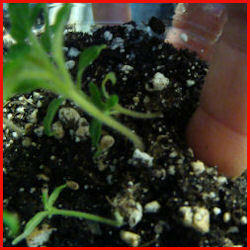 Set up an oscillating fan or brush your hand over the seedlings when you look in on them. If you transplanted your seedlings in pairs, wait until they've grown a couple more leaves and then pick the strongest one. 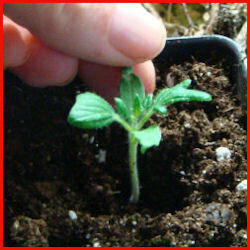 Snip or pinch the stem of the "spare" seedling. Don't disturb your chosen one by trying to separate them now. Be brave and chop it off. After a few more weeks under the lights, you'll have wonderful sturdy little plants that will grow like gangbusters in your garden. I hope you'll have your best tomato garden ever this year, from seed to harvest! 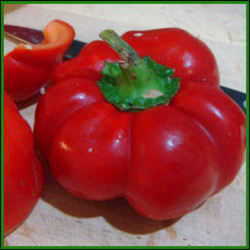 You'll find loads of enthusiasm and expertise in the Tomatoes discussion forum. Move your mouse over images and links in this article for more information (let your cursor hover for a few seconds, and a pop-up caption will appear). Photos by Jill M. Nicolaus.